The Oval Gipsy guitar I make is based on the Selmer. This instrument became very popular by the famous Django Reinhardt. At this moment the Gipsy Jazz is very popular, think about the Rosenberg trio, Jimmy Rosenberg, Robin Nolan, Birelli Lagrene, etc etc. Typical for this guitar is the very direct attack and the loud treble that cuts trough like a knife. For fast solo playing you need a bright tone, loud and clear with good vibrato. Not only a good treble, but also a solid bass is necessary for gipsy jazz. That is not easy to find. 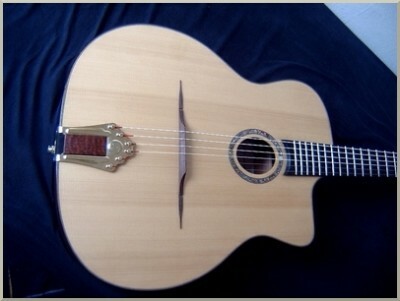 To play Gipsy Jazz you really need a good Gipsy guitar. A good gipsy guitar is a handmade instrument. For the Oval Gipsy I use solid woods. I prefer Rosewood or sometimes Maple for the back and sides. The top is European spruce or red cedar. Selmer used the spruce for the tops. But I’ve made very good instruments with cedar tops too. The neck is made of Mahogany, Maple or Walnut. 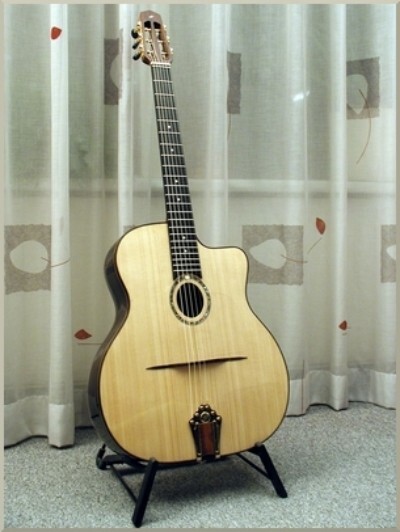 All necks are reinforced by a truss rod or by carbon fibre. The regular scale is 66,5 cm and the fingerboard is ebony. I can make this instruments to your personal wishes. I played lot`s of guitars, but my Oval Gypsy Van Bergeijk is my favourite"
Lawrence: "It sounded mature and full. Clear tone, like a bell. The lows are also beautiful, not muddy at all. Lots of tonal colour. It sounded exquisite in the context of the group. Everyone really liked the sound. The solo lines sounded great. Such a playable neck. Clean and plenty of space. So responsive! I appreciate the even sound. The response to my new instrument is all positive. Everyone who hears it likes it. Very warm sound."